Sometimes bad things happen to good data. Whether you’ve accidentally deleted an important file, forgotten the passcode to your locked device, or lost or destroyed your iPhone somewhere along the way, you don’t have to let your valuable files, photos, and other data disappear forever. With Aiseesoft Mac FoneLab, you can easily recover files from a locked or otherwise inaccessible iPhone, iPad, or iPod Touch. You can even easily recover files that you’ve long since deleted. Mac FoneLab builds on Apple’s own tools for managing your iOS data by letting you recover the contents of your phone directly via USB or giving you access to the contents of an iTunes backup file. With it, you can search for the files you need, or simply recover everything from the device or backup file all at once. If your phone takes a tumble down the escalator or falls face down on the pavement, you can still get to its data no matter how badly damaged the screen looks. As long as your iOS device can boot up, you can use Mac FoneLab to access its data. Simply launch FoneLab on your Mac, plug the device into your USB port, and click Start. FoneLab will begin analyzing your device’s storage to discover all of its contents, even if the device is locked. Once the scanning is done, you can use the Recover menu to navigate through your files, call and message logs, and other data to find exactly what you’re looking for. If the contents you want have been deleted, click the switch labeled “Only display the deleted item(s)” to narrow your search. Once you find the files you’re looking for on your device, select them. It’s a good idea to specify an output folder for FoneLab to copy your files to. This will make it easier to work with the files once they’re retrieved. Click the ‘…’ button next to the Output Folder field near the bottom of the screen, and browse to the folder you’d like the files copied to. With your files selected and your output folder chosen, click Recover to transfer the data to the designated folder on your Mac. If your device has been lost or stolen, you’re still in luck. FoneLab can open up the contents of any iTunes device backups on your Mac, and give you the same level of access that you’d get with an attached device. In fact, the steps for retrieving your data from a backup file are exactly the same, except that you select from a list of backups on your Mac’s hard drive rather than connect the device to your USB port. You can then either selectively recover individual files or output all the contents of the missing device to a folder. Recovering data from an iTunes backup is typically much quicker than from a device, because the data’s already on your Mac. By default, Mac FoneLab will automatically open your output folder once it’s finished recovering your files. From there, you can use the data as if it had never been lost at all. 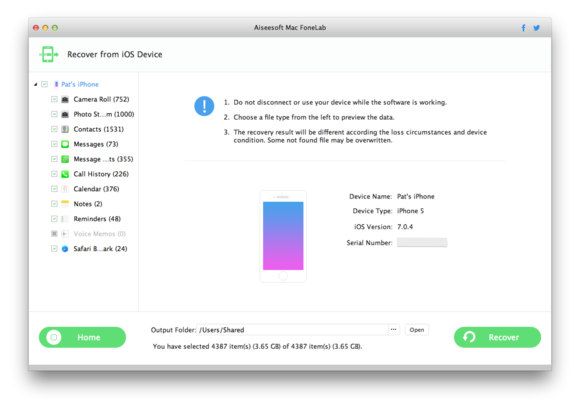 Aiseesoft Mac FoneLab makes it surprisingly easy to get data back from your lost or damaged iOS devices, even if you don’t know the passcode. Click here to purchase the software with an exclusive discount for Macworld readers. 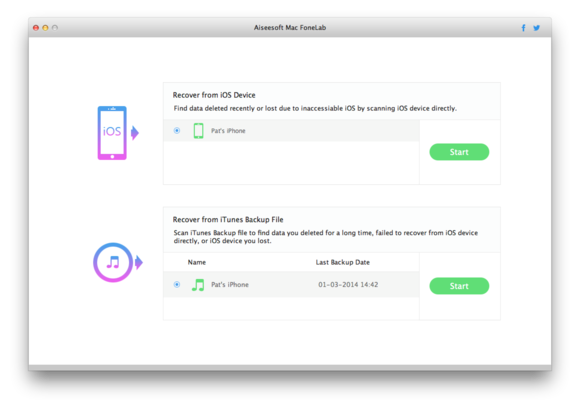 This story, "How to recover lost data from your iPhone, iPad, or iPod Touch" was originally published by BrandPost.